This interesting name is of English origin, and has three possible sources, the first being from the Norman personal name "Hamo(n)", from the Germanic "Haimo", with the first element "haim" meaning home, the "d" being excrescent. The name was introduced into England by the Normans after the Invasion of 1066. The second source is from the Old Norse personal name "Hamundr", composed of the elements "ha", high, and "mund", protection. The third source is from the Old Norse personal name "Amundr", which is composed of the elements "a", great-grandfather, ancestor, and "mund", protection. This name was not as common as "Hamundr" and it is sometimes confused with it. Both names were introduced into England between the 8th and 9th Centuries. 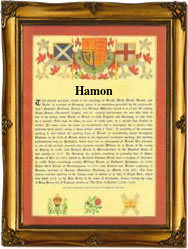 The modern surname can be found recorded as Hammond, Hammand, Hammant, Hamman, Hamon, and Hammon. An interesting namebearer was one John Hammond (died 1617), who was a physician to James 1 (1603 - 1625); he was made a fellow of Trinity College, Cambridge, in 1573. The first recorded spelling of the family name is shown to be that of Walter Hamund, which was dated 1242, in the "Free Rolls of Herefordshire", during the reign of King Henry 111, known as "The Frenchman", 1216 - 1272. Surnames became necessary when governments introduced personal taxation. In England this was known as Poll Tax. Throughout the centuries, surnames in every country have continued to "develop" often leading to astonishing variants of the original spelling.